We don’t want to believe the worst of our fellows. When we see an error, we want to believe it was an accident, a typo, a momentary oversight. That’s the impulse that drove Colleen to check, but she says every single decal on this truck was the same. SADFACE, our faith in humanity is once again shattered! So I get this email from Kacia, with the subject line “Cute ad, but…” The email includes nothing else but this picture. So I’m killing my eyeballs trying to read the mini-print, and then I’m thinking, Is she pointing out the hideous capitalization? Because it’s not to my taste, but it’s pretty clearly an editorial decision, and I’ve always said I don’t take issue with consistent, clear editorial decisions like that. So I have decided to unfortunately pass on this submission, and I click the little “next” button, and there’s another email from Kacia! And the subject line of this email is “…one flaw.” And this photo allows us to ZOOMHANCE! We could be contrary and wonder whether this illustrious shopping place, which does seem to have quite a wide variety of offerings, might not actually have a store selling sand, tumbleweeds, camels, and whatnot. But Kacia assures me that there is no such establishment, and I will take her word for it. GrammarTroika Sister #1 Colleen says she sees a perfect logic in this neologism. I get the logic, but it still makes my teeth hurt. As does the random spacing and capitalization. It’s Friday, have at it. Way back when I wasn’t posting, in October, Lisa found this and was outraged. But this is one of those posts that doesn’t raise my hackles. Now, Lisa also noted that the woman on the left is Beth, and the woman on the right is Page. 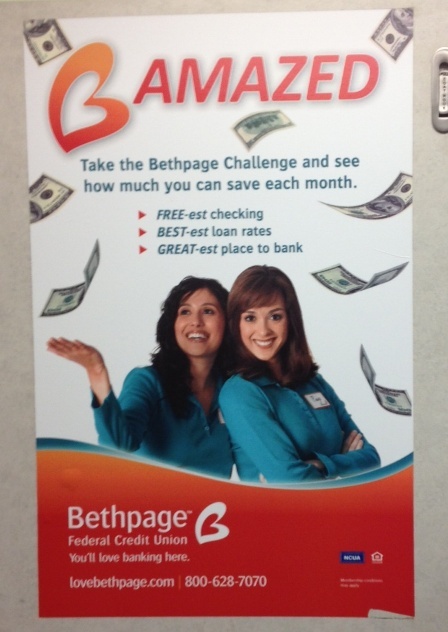 I am annoyed that her name is spelled that way, and that the company isn’t named BethPage, which just suits my aesthetic better. But the nonsense doesn’t annoy me much. This is a link to someone else’s post, because it is that excellent. Go check out a little piece called Brid food sign tells a story of retail woe at BoingBoing! The burgers look good, but that’s about it. Apparently, USA Today ranked this place’s burger #1 in Minnesota. But Kacia would like to give them a thumbs-down on punctuation. She’s also frustrated that “rootbeer” is one word. Obviously Messrs Casper and Runyon subscribe to the apostrophe-after-a-vowel school of apostrophe usage, as they haven’t bothered using one in “floats” or “malts.” But as we all know, this school of thought is WRONG. As for “rootbeer”? Well, the squiggly red line is telling me that’s wrong. But funnily enough, it doesn’t upset my stomach. In fact I find it far more disquieting to stop and think about root beer being made out of roots. 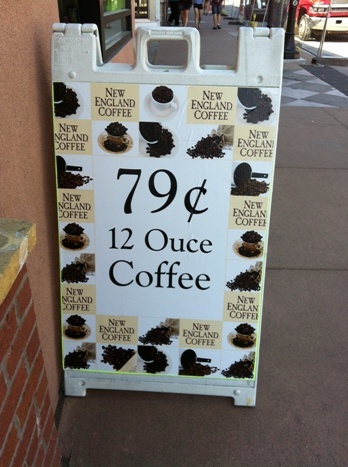 It’s kind of like mincemeat: one of those words you just shouldn’t over-analyze. But technically, you’re right, Kacia, it’s two strikes. Let’s hope the burger wasn’t a third! Colleen says she’d never send her kids to this school. 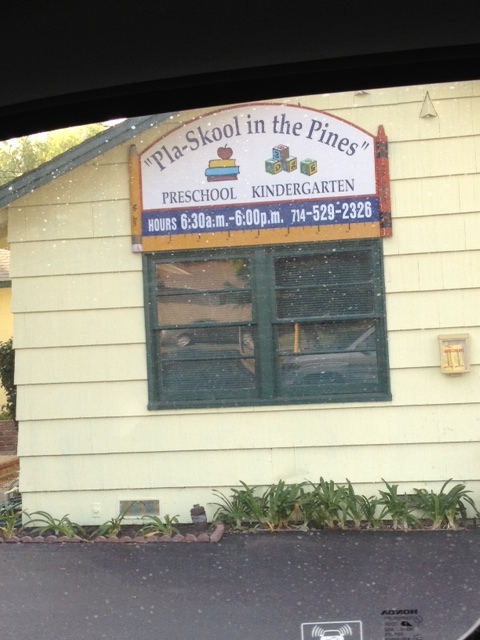 But I wonder if they wouldn’t actually get a good early education in legal precision. Clearly, the owners don’t want you suing when they duck tape your children to their desks, let them watch television all day, and then march them home under the maple trees. Bonus points for the shot from the car! I think Mayor Bloomberg would approve. Kicking off a full week of submissions from GrammarTroika sister #1, we have something that will make you hungry. Or nauseate you. You pick! Apparently Jack in the Box “requirs” I.D. for certain transactions. This is one label, so not one of those situations where the letter fell off. 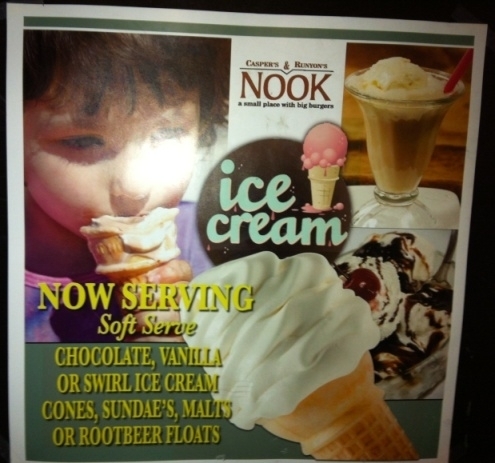 Someone actually typed it this way, read it and thought “nailed it,” before posting to the menu board. I also appreciate the redundancy & incorrect abbreviation of $15.00 DLS. Fifteen dollars dollars, y’all! I’m with you on both counts, Colleen. 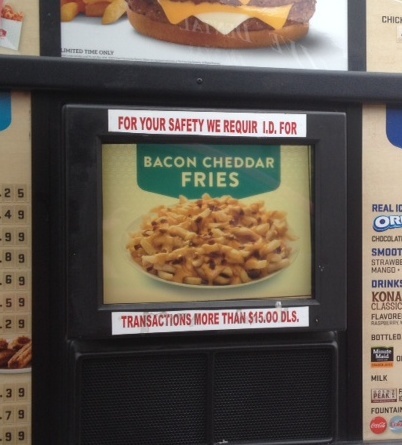 Personally, I’m also hung up on the fact that this signage very clearly informs me that Jack in the Box requires ID before you can purchase bacon cheddar fries. Maybe not a bad idea! That’s the subject line of an e-mail I received last night from my father. And he was not wrong! Below please find my mother’s birthday cake. First of all, my mother’s name is Helen. …Just kidding. Her name is actually Marjorie. 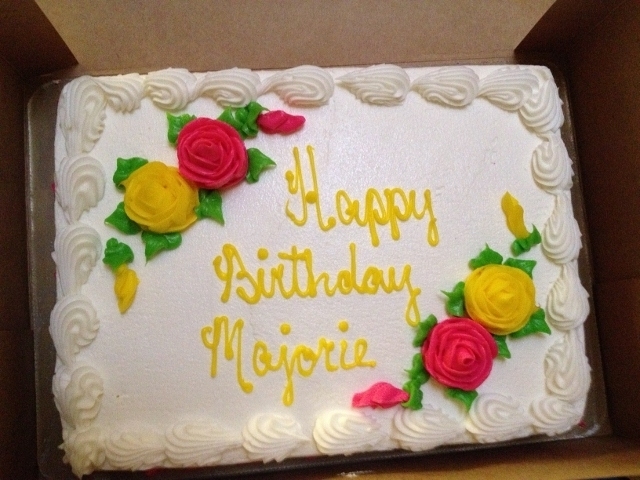 But that is not how you spell Marjorie.